Spiceworks: An open letter to Nikola Tesla, on his birthday. Today is Nikola Tesla’s 157th birthday, a holiday widely recognized as “Tesla Day.” In his honor, I present to you, SpiceHeads, an open letter to Nikola Tesla. Is it alright if I call you Nikola? It’s your big day, so it really is up to you. I am writing to say thank you for your contributions to modern electricity. Granted, I have only a limited knowledge of alternating currents, but from what I’ve read, I owe you a lot. I live in Austin, where it is approximately 1500 degrees Fahrenheit for 10 months a year, so I am grateful for your contributions to air conditioning. I also frequently use lamps and fans, I regularly charge my cell phone and electric toothbrush, and I keep most of my food in a refrigerator. Thank you for that possibility. It seems to me that you are, in short, a baller. Your work led Marconi to the invention of the radio, you established the first hydroelectric plant at Niagara Falls, and you should have been credited for the invention of radar as well as x-rays. Your research powered the transistor, which powers essentially everything. You’re a big deal; people know you. You have a crater named after you on the moon. Serbia named a minor planet after you. Leonardo Di Caprio and Ben Affleck drive Tesla Roadsters, super badass electric cars. I would like to take this opportunity to apologize on behalf of Thomas Edison, too. He ripped you off again and again, and then blamed it on America. That’s not fair, and if I had 1 million spare dollars, I’d donate it to the efforts to restore Wardenclyffe Tower and honor your work in a museum, all in Edison’s name. Sure, sources say you were in love with a pigeon. I’m in love with a mad man in a blue box. We all have our crazy. Happy birthday, Nikola. You don’t look a day over 150. Kelly Fine, a big fan. What would your letter to Nikola say? Let me know in the comments, and join in the Tesla Day celebration! Despite my weird hands/claws, I did manage to have an incredible amount of fun. If I could install one of these tunnels in my tiny apartment, I would. 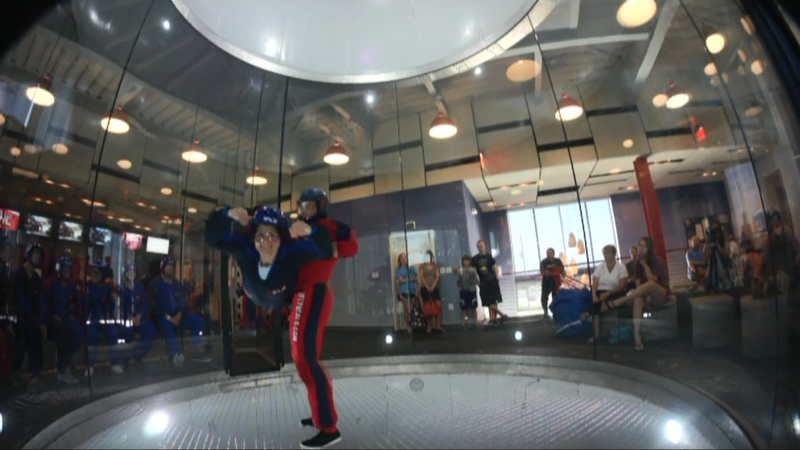 In addition to the fun, iFly also gave the summer interns the chance to bond outside of Spiceworks HQ. You can’t really know your coworkers until you've seen them in coveralls, goggles and a helmet, face rippling in the wind. I feel incredibly lucky to be part of such a fun, intelligent team, and so thankful for Spiceworks’ awesome internship program. According to David Weiser, IT intern, “My favorite part was when I didn't [content removed by moderator] myself.” I feel confident that the team bonding was his second favorite part. But I know the real reason you’re reading this blog post is to see the video of SpiceRex in the wind tunnel, so without further ado, I am proud to present "SpiceRex Takes Flight."